The number one reason most homeowners have high electric bills and expensive AC repairs is due to lack of ongoing routine air conditioning maintenance in Queens, NY. Air conditioners are like any other form of machinery. They consist of moving parts which wear out of time. 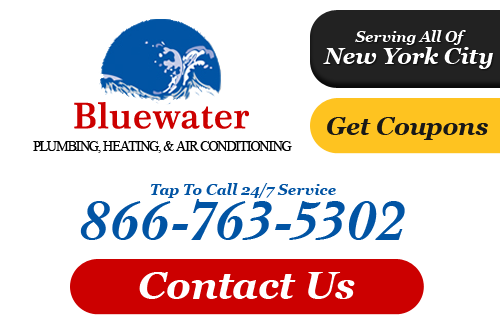 Bluewater Plumbing, Heating, and Air Conditioning can ensure that the necessary maintenance and upgrades are performed regularly. This keeps your system operating at peak performance and helps save you time and money in the long run. Checking additional items such as vents, pumps, and air ducts. Whether it's during the summer or winter in Queens, extreme temperatures are more than just an inconvenience. They are also a safety issue. One of the greatest benefits of ongoing, preventative maintenance on your air conditioner is knowing that when everyone else's systems go out, yours will keep operating with no problems at all. This keeps your family comfortable and safe when summer reaches its peak throughout July and August. It gives you peace of mind knowing your unit will be there for you when you need it most. When you partner with Bluewater Plumbing, Heating, and Air Conditioning, you get the advantage of working with highly trained professionals in the field. Our Queens air conditioning company services hundreds of A/C systems each summer, and we have worked on all brands and models for both home and business owners. We are certified in all areas of maintenance and provide fast, efficient service that brings you 100% satisfaction every time. Contact us today and schedule a visit from one of our friendly air conditioning repair and maintenance specialists. If you are interested in an estimate for air conditioning maintenance in Queens or the surrounding areas, please call 866-763-5302 or complete our online request form.